No, I didn’t have to take the written test or a driving test in order to get my new license. New residents of Pennsylvania who hold a valid driver’s license from another state in the United States must get a Pennsylvania Driver’s License within 60 days after moving to PA and surrender their out-of-state driver’s license and/or ID card. If you are a new resident of Pennsylvania and your prior state’s driver’s license has been expired for more than six months or you do not possess your prior state’s driver’s license you will be required to apply for a PA Learner’s Permit and take the Vision, Knowledge and Road Tests. It is, however, recommended that such a driver obtain the Pennsylvania Driver’s Manual in order to “help you become a safe driver and enjoy your driving privilege in our beautiful state.” I picked one up on my way out of the PennDot Driver License Center. Which was a very good idea. Because this is something you just don’t see in the California Driver Handbook. 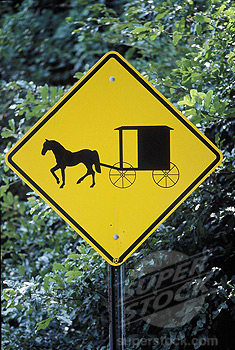 This sign is posted in areas where slow moving, horse-drawn vehicles cross or share the roadway with motorized vehicles. LOL! That is only in your neck of the woods. You don’t see many of those signs by me. Lots of deer signs though… Hope to see you soon. Interesting. Have you seen one yet? What’s really weird is that the cart only has 2 wheels and no driver. It has 4 wheels, 2 more are behind those 2. No driver, is due to modesty. Welcome to my Commonwealth. At least when you’re following the Amish, you have a lovely view of farmland and no pollution in your face. Last month is California it took us 2 hours to go from Santa Monica to Downtown LA due to traffic. Give me a horse and buggy delay instead anytime! Although, if you do get her one, I vote miniature. That would be adorable. I just finished reading a book set in the Amish country…ironic. Yes, do watch out for deer in the countryside. BTW the Amish farmer’s markets are wonderful and they used to be organic. The sticky buns are wonderful donut substitutes also. I grew up near Amish Lancaster County. Beautiful area. Hope you’re all enjoying your new home. The mother knew this day would come. She tries to give a simple yet accurate answer, without conveying shame or embarassment. She knows how important it is not to overreact.